Well, three, actually, but let’s go with the non-literal interpretation of the usage. It’s a touch grainy since the software is pushing the effective ISO way, way up, but all things considered, for something that I just pulled out of my pocket and was listening to the ballgame on and tracking my exercise stroll, it’s pretty amazing. 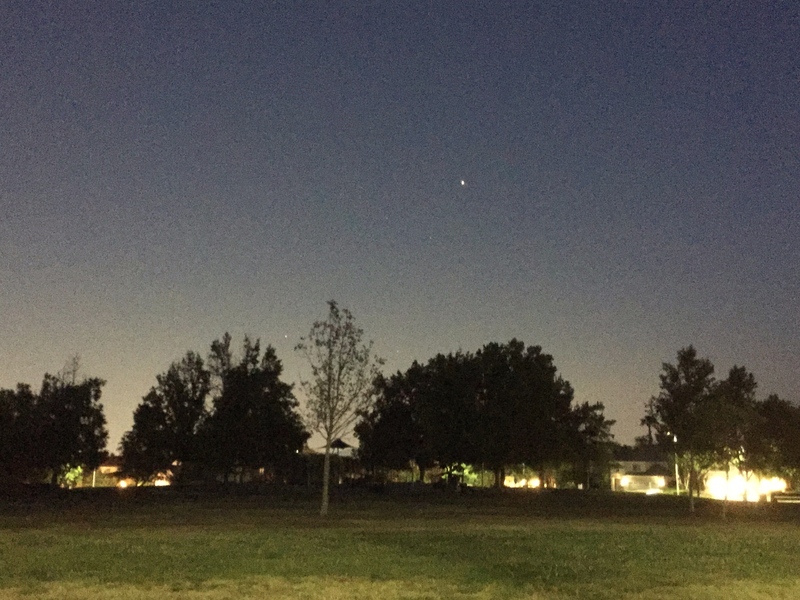 The bright object (click on the image to see it full sized) is Mars, and while you don’t get an idea from this how bright reddish-orange it truly is, you can get an idea of how brightly it stands out in the sky. (It will still be there tomorrow, and the next day, and next week if you can’t see it tonight, although it will be dimming slightly every night from here out.) But on closer examination, that’s not all that you can see. Just clearing the horizon to the left of that little foreground tree is Saturn, and to the right of it is Antares. The fact that you can see them at all through the thick atmosphere near the horizon and all of the light pollution of Los Angeles is a good indicator of just how bright they are. Between them and Mars you can see two of the bright stars in the “head” of the constellation Scorpius. This would be spectacular in a dark, dark sky with a good camera setup, because rising straight up out of this field of stars and planets would be the Milky Way in all its splendor. In an hour or so, Capricorn will be rising, and in this region of the sky, looking straight into the core of the Milky Way, even a small telescope can pick out dozens and dozens of bright nebula. In the city – not so much. Above and behind me, still very high in the sky and the brightest thing up there if the Moon or ISS isn’t up, you can find Jupiter. If you have even a pair of binoculars you can pick out the four Galilean moons. If you watch over just a few hours you can watch those moons move back and forth as they orbit Jupiter. Just don’t tell anyone in the Vatican. They tried to burn Galileo at the stake for heresy for watching. It’s kinda cool being about to see Mars without a telescope (I know better with one!). I can still see Jupiter in the nights sky but for now, it’s Mars over the sea cycling back late with it’s redish hue that even I can see without my glasses!